What Are Earwigs And How To Get Rid Of Them? How Can You Tell That There Are Cockroaches In Your House? Weeds are undoubtedly a serious problem for gardeners as well as homeowners with a backyard. These unwanted plants can grow and survive even in harsh climate. You may try some home remedies to kill the weeds but they tend to come back again and again. They mostly grow from the soil but can also be found in the crevices of a concrete wall. There are a number of reasons for which the weeds are harmful to your living space. Firstly, they take up useful nutrients from the soil which make it difficult for other plants to survive. This is a huge problem for gardeners. Secondly, if you find any weed coming out of the crevices of a concrete wall then you need to worry. Weeds generally spread roots inside the concrete walls which causes the wall to crack. If you find weeds growing out of eh crevices, you need to act soon. There are lots of other reasons for which weeds are harmful to you and your living space. Therefore, you need to do something in order to kill those unwanted plants and prevent them from growing again. The best way to get rid of these unwanted plants is opting for a reputed weed control service from Las Vegas. The professionals are trained and experienced in weed controlling and they will address your problems efficiently. Before you hire a professional for weed control, you need to understand a few things. There are a lot of professionals who will do the necessary things to take care of the unwanted plants growing around you but all of them have some specializations. Moreover, all professionals are not equally efficient and experienced. You do not want to entrust some unreliable with your task. Therefore, to hire the best professional, you need to consider certain aspects. 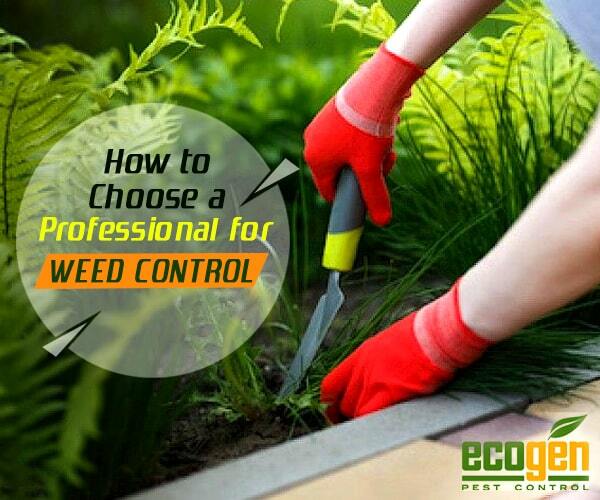 The weed controlling professionals use different herbicides, chemicals and other products that are not always environment-friendly. Since there are a large number of professionals ready to cater to your requirements, you need to choose the one who will assure you of safety in all terms. Some of the reputed companies use all safe and environment-friendly products that are not harmful to you as well as other plants in your backyard. Therefore, always check the products that the professional would use. More often than not, renowned professionals would try some manual ways to eliminate weeds from your living space rather than just spraying chemicals and herbicides. This is a good strategy as spraying will only kill the part of the weed which is exposed. Deep down, the plant will start growing after a few weeks. Manual procedures are necessary to completely remove any traces of weed. Therefore, choose the professional would assure you of an exhaustive treatment to get rid of weeds. As already said, you must consider choosing a professional wisely. When it comes to making a wise decision, checking the price is necessary. Some companies would charge exorbitantly and hiring such a company is not a wise decision. Compare the prices and settle for a company that would offer safe and efficient weed control service in Las Vegas at affordable prices. Weed is a serious problem and in order to get rid of them, you need to hire a professional who would effectively kill the weed and prevent them from coming back. Oftentimes, a pest control service in Las Vegas would also provide service to address the problems arising with unwanted plants in the backyard and other spaces. The aforementioned conditions are surely going to help you find a reputed professional providing weed control services. sometimes the pest infestations in your house can trouble you by posing health threats and other hazards. There may be times when you are not even aware of the tiny creatures infesting your home. At those times, when the infestations are severe or invisible, it is better to hire a pest control professional and evade the intruders efficiently. Pest control should be a regular task that you need to conduct to make sure that your abode is free of any creature. Moreover, an efficient pest control treatment can restrict pests from coming back. When the infestation has spread in your house, it is not safe for humans, especially the kids. This is because there are a number of pests that are not visible to the naked eye and you can face multiple threats. Firstly, it feels irrittating to have obnoxious creatures in and around your house. Secondly, the pests can contaminate food, bite you, spread diseases and whatnot! A pest control professional is the only reliable person that can save you from potential dangers. As already said, pests are harmful and a number of health hazards are associated with pest infestations, the risk varies depending on the types of pests that are infesting your house. A certified professional from a reputed pest control service in Las Vegas is likely to help you with all kinds of pest infestations in your home. There is only one hard work you need to do and that is choosing the right professional. Check the certification – Before hiring any professional, always be careful about checking their certification and license. The professionals carry out many procedures to free your house from pest infestations that may pose hazards if done wrong. Therefore, always check for the certification and make sure that the service you have opted for is reliable. Check the experience – Experience matters a lot when it comes to a pest control company. If you are to hire a professional, always make sure that how much experienced the professional is and what projects he/she has successfully completed. This way you can avail the best organic pest control service. You do not want to run into a company that has started working recently. The more experienced the professional is, the more perfect and safe your work will be. Consider the expense – Some pest control companies will charge exorbitantly. Make sure that the one you are hiring is charging a reasonable price. Though the charges vary depending on the type of work you are asking the company to do, you must tally three to four different companies and settle for the one that suits your budget. Conclusion – When there is a pest infestation in your house, the best way to evade all the intruding pests is to hire a pest control professional. There are a lot of options available when it comes to choosing a pest control professional but you should be careful about whom you are choosing due to a few reasons. These aforementioned tips are going to help you get through the hiring process easily. EcoGen Pest Control today announced the company has successfully transitioned into its new company headquarters on Hacienda Avenue, just west of I-15, in Las Vegas, Nevada. The move occurred due to the company’s continued rapid expansion in Southern Nevada and the need for more space and upgraded facilities. Along with the move, all staff and service professionals received upgraded equipment and training, thus providing our valued customers with state of the art services and products. 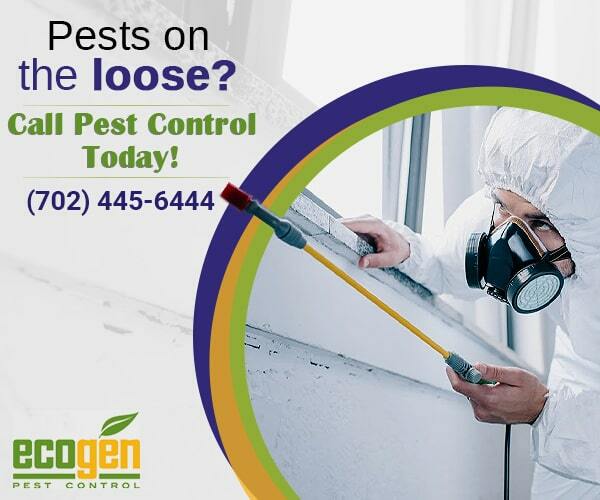 EcoGen Pest Control prides itself on providing the highest quality, most environmentally friendly, pest control products and services in the industry. Copyright @ 2019 ecogen. All Rights Reserved.